2 Why should I use and trust HPSS? The High Performance Storage System (HPSS wikipedia) is a tape-backed hierarchical storage system that provides a significant portion of the allocated storage space at SciNet. It is a repository for archiving data that is not being actively used. Data can be returned to the active GPFS filesystem when it is needed. In the context of the Compute Canada Resource Allocations is it called 'nearline'. HSI is a client with an ftp-like functionality which can be used to archive and retrieve large files. It is also useful for browsing the contents of HPSS. 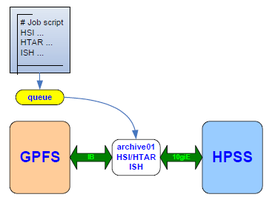 HTAR is a utility that creates tar formatted archives directly into HPSS. It also creates a separate index file (.idx) that can be accessed and browsed quickly. ISH is a TUI utility that can perform an inventory of the files and directories in your tarballs. Why should I use and trust HPSS? HPSS is a 25 year-old collaboration between IBM and the DoE labs in the US, and is used by about 45 facilities in the “Top 500” HPC list (plus some black-sites). Over 2.5 ExaBytes of combined storage world-wide. Environment Canada also adopted HPSS in 2017 to store Nav Canada data as well as to serve as their own archive. 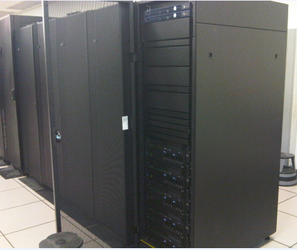 Currently has 2 X 100PB capacity installed. Data on cache and tapes can be geo-distributed for further resilience and HA. Highly scalable; current performance at SciNet - after the hardware and software upgrades in 2019 - Ingest and Recalls ~150 TB/day aggregated. HSI/HTAR clients also very reliable and used on several HPSS sites. ISH was written at SciNet. Expanded storage capacity is provided on tape -- a media that is not suited for storing small files. Files smaller than ~200MB should be grouped into tarballs with tar or htar. We strongly urge that you use the sample scripts we are providing as the basis for your job submissions. First, nearline, archive, and HPSS all mean the same thing at SciNet. HPSS is the true name of this storage system. Second, HPSS is not a regular file system, and as such is not mounted on the regular login and datamover nodes. Interaction with the HPSS system is therefore different than using simple copy, move, and tar commands. Before trying to use the system, you need to confirm you are part of a group that already has a HPSS RAC allocation, otherwise email SciNet support and request an HPSS account (or else you will get "Error - authentication/initialization failed" and 71 exit codes). THIS set of instructions on the wiki is the best and most compressed "manual" we have on how to use HPSS. It may seem a bit overwhelming at first, because of all the job script templates we make available below (they are here so you don't have to think too much, just copy and paste), but if you approach the index at the top as a "case switch" mechanism for what you intend to do, everything falls in place. Submitting jobs to the niagara archive queue (archiveshort or archivelong), and using HTAR or HSI on the archive02 node. These tools are optimized for speed and scale, to efficiently deal with small files, and are very resilient to timeouts due to slow tape access. That is our recommendation for large transfers. Submitting an interactive job to the VFS queue (vfsshort), and using standard linux tools (cp, rsync, ls, cd, ...) to access the VFS based /archive mount point on the vfs02 node. We don't recommend this way, unless you are transferring only a handful of files, or just navigating the naming-space (directory tree similar to the other niagara file systems). 5) now try the other cases and so on. In a couple of hours you'll be in pretty good shape. On the hpss-archive02 node, your bgq home and scratch directories can be found in the environment variables $BGQHOME and $BGQSCRATCH. On the vfs02 node, your archive directory can be found in the environment variables $ARCHIVE, while your bgq home and scratch directories can be found in the environment variables $BGQHOME and $BGQSCRATCH. All access to the archive system is done through the NIA queue system. Job submissions should be done to the 'archivelong', 'archiveshort' or 'vfsshort' partitions. Short jobs are limited to 1H walltime by default. Long jobs (> 1H) are limited to 72H walltime. Users are limited to only 2 long jobs and 2 short jobs at the same time, and 10 jobs total on the each queue. There can only be 5 long jobs running at any given time overall. Remaining submissions will be placed on hold for the time being. So far we have not seen a need for overall limit on short jobs. Jobs to the 'archivelong' and 'archiveshort' partitions must use htar or hsi. These tools are optimized for speed and scale, to efficiently deal with small files, and are very resilient to timeouts due to slow tape access. The 'vfsshort' partition can only be used for interactive jobs, so that you can navigate the VFS based /archive mount point (Virtual File System), and/or make small file transfers to/from HPSS using standard linux tools (ls, cd, cp, rsync, etc). This access is always limited to 1 hour. You may want to acquire an interactive shell, start an HSI session and navigate the archive naming-space. Keep in mind, you're restricted to 1H. NOTE: the VFS based /archive mount point is not visible on the archive02 node with the standard linux prompt. You must use HSI (or get an interactive session on the vfsshort partition). echo "Creating a htar of finished-job1/ directory tree into HPSS"
# htar WILL overwrite an existing file with the same name so check beforehand. where JOBID is the job number of the archive recalling job that must finish successfully before the analysis job can start. Please aggregate small files (<~200MB) into tarballs or htar files. HTAR is a utility that is used for aggregating a set of files and directories, by using a sophisticated multithreaded buffering scheme to write files directly from GPFS into HPSS, creating an archive file that conforms to the POSIX TAR specification, thereby achieving a high rate of performance. HTAR does not do gzip compression, however it already has a built-in checksum algorithm. Files larger than 68 GB cannot be stored in an HTAR archive (unfortunately old 32-bit limitation). If you attempt to start a transfer with any files larger than 68GB the whole HTAR session will fail, and you'll get a notification listing all those files, so that you can transfer them with HSI. Files with pathnames too long will be skipped (greater than 100 characters), so as to conform with TAR protocol (POSIX 1003.1 USTAR) -- Note that the HTAR will erroneously indicate success, however will produce exit code 70. For now, you can check for this type of error by "grep Warning my.output" after the job has completed. With the recent consolidation and centralization of all Compute Canada accounts under CCDB, the new uid/gid numbers are now in the 3000000-6000000 range, in breach of same above TAR posix protocol, so htar will issue a benign notification similar to this: ERROR: [Uint32_tToOctal]Octal field [thb_uid] overflow - width=8 value=3000195. Not to worry if the jot still gets a successful exit signal from the execution script. Unlike with cput/cget in HSI, "prompt before overwrite", this is not the default with (h)tar. Be careful not to unintentionally overwrite a previous htar destination file in HPSS. There could be a similar situation when extracting material back into GPFS and overwriting the originals. Be sure to double-check the logic in your scripts. Check the HTAR exit code and log file before removing any files from the GPFS active filesystems. Note: If you attempt to start a transfer with any files larger than 68GB the whole HTAR session will fail, and you'll get a notification listing all those files, so that you can transfer them with HSI. cget Conditionally retrieves a copy of a file from HPSS to GPFS only if a GPFS version does not already exist. cd,mkdir,ls,rm,mv Operate as one would expect on the contents of HPSS. HSI doesn't currently support renaming directories paths during transfers on-the-fly, therefore the syntax for cput/cget may not work as one would expect in some scenarios, requiring some workarounds. Simple commands can be executed on a single line. hsi "mkdir LargeFilesDir; cd LargeFilesDir; cput tarball-in-GPFS : tarball-in-HPSS"
However the syntax forms such as the ones below will fail, since they rename the directory paths. One workaround is the following 2-steps process, where you do a "lcd " in GPFS first, and recursively transfer the whole directory (-R), keeping the same name. You may use '-u' option to resume a previously disrupted session, and the '-p' to preserve timestamp, and '-h' to keep the links. The most common interactions will be putting data into HPSS, examining the contents (ls,ish), and getting data back onto GPFS for inspection or analysis. A very trivial way to list the contents of HPSS would be to just submit the HSI 'ls' command. Warning: if you have a lot of files, the ls command will take a long time to complete. For instance, about 400,000 files can be listed in about an hour. Adjust the walltime accordingly, and be on the safe side. However, we provide a much more useful and convenient way to explore the contents of HPSS with the inventory shell ISH. This example creates an index of all the files in a user's portion of the namespace. The list is placed in the directory /home/$(whoami)/.ish_register that can be inspected from the login nodes. Note: the above warning on collecting the listing for many files applies here too. This index can be browsed or searched with ISH on the development nodes. ISH is a powerful tool that is also useful for creating and browsing indices of tar and htar archives, so please look at the documentation or built in help. you may use 'mv' or 'cp' in the same way as the linux version. echo "HPSS file and directory management"
Avoid using recursive/looped deletion instructions on $SCRATCH contents from the archive job scripts. Even on $ARCHIVE contents, it may be better to do it as an independent job submission, after you have verified that the original ingestion into HPSS finished without any issues. echo "Deletion of an outdated directory tree into HPSS"
You may feel more comfortable acquiring an interactive shell, starting an HSI session and proceeding with your deletions that way. Keep in mind, you're restricted to 1H. After using the qsub -q archive -I command you'll get a standard shell prompt on an archive execution node (hpss-archive02), as you would on any compute node. However you will need to run HSI or HTAR to access resources on HPSS. HSI will give you a prompt very similar to a standard shell, where your can navigate around using commands such 'ls', 'cd', 'pwd', etc ... NOTE: not every bash command has an equivalent on HSI - for instance, you can not 'vi' or 'cat'. Combining commands in this fashion, besides being HPSS-friendly, should not be that noticeably slower than the recursive put with HSI that stores each file one by one. However, reading the files back from tape in this format will be many times faster. It would also overcome the current 68GB limit on the size of stored files that we have with htar. To top things off, we recommend indexing with ish (in the same script) immediately after the tarball creation , while it resides in the HPSS cache. It would be as if htar was used. Optimal performance for aggregated transfers and allocation on tapes is obtained with tarballs of size 500GB or less, whether ingested by htar or hsi ( WHY?). Be sure to check the contents of the directory tree with 'du' for the total amount of data before sending them to the tar+HSI piping. We compiled multi-threaded implementation of gzip called pigz (http://zlib.net/pigz/). It's now part of the "extras" module. It can also be used on any compute or devel nodes. This makes the execution of the previous version of the script much quicker than if you were to use 'tar -cfz'. In addition, by piggy-backing ISH to the end of the script, it will know what to do with the just created mydir.tar.gz compressed tarball. Specifies that HTAR should generate CRC checksums when creating the archive. The checksum algorithm is very CPU-intensive. Although the checksum code is compiled with a high level of compiler optimization, transfer rates can be significantly reduced when checksum creation or verification is in effect. The amount of degradation in transfer rates depends on several factors, such as processor speed, network transfer speed, and speed of the local filesystem (GPFS). This will checksum the contents of the HPSSpath against the original GPFSpath after the transfer has finished. Enter your Compute Canada username and password. In the 'File Transfer' tab, enter 'computecanada#hpss' as one of the Endpoints. To authenticate this endpoint, enter your SciNet username and password. This page was last edited on 13 April 2019, at 22:07.